Imagine a situation where you have been selected and shortlisted for an interview. As most candidates, you feel that this is a great opportunity to showcase your skills and talents to the interviewer and with high hopes of bagging the job, you go and attend the interview. And when the company starts the selection process, and asks you a tough question, you start feeling nervous and tensed. Because of the stress and the pressure accumulated, you feel that there is a sudden urge to fart and this causes you to lose concentration on the interview questions asked to you by the employer. In such an awkward position, there are many doubts and questions that comes into your mind. Should I let out the fart? Should I try to suppress it? What if the interviewer notices it? What will he think about me? There are many issues that goes across the mind of the candidate. What should I do if I fart during an interview? Many people have the first inclination of letting the fart out, so that they could be more comfortable and concentrate more on the interview. They will let out the fart and will act as if nothing has happened. The candidate tries to keep his dignity and image, but as a façade he tries to be calm and composed. Unfortunately, this does not usually work on many interviewers. They may not point out that you farted during the interview, but in their mind they will only think about the fart. It will also be considered to be rude to any one surrounding the candidate and their mannerisms will be deemed as unethical and uncultured. Try not to be that person. Also, farting in front of the interviewer will give a chance for others to laugh at you and make you the laughing stock in the end. Some interviewers just don’t even care and would carry in with the interviews only focusing on the questions and your responses. Instead, of letting it out. You must use your willpower and determination to overcome this mishap and prevent it from happening. Try not to fart during the interview. Having to take responsibility of your own actions and practices is considered as a good behaviour worldwide and is taken on a positive note. While on other hand, not taking responsibility of something that you did and hiding and playing along like nothing happened will be frowned upon by the employers. They will treat you as an employee who does not know how to tackle unpredictable and sudden situations. People who are liars and make up excuse for not just reason whatsoever are, all frowned upon and ignored by other individuals , irrespective of whatever field the candidate is applying. There is a famous story which was narrated by the former American president Abraham Lincoln. Through this story he stated how a person should act, if by accident he let out a fart during a social gathering. The social gathering can be of any form- be it an informal meeting or an interview. This is the famous fart joke by the former president and it is called as the fart carver. The story explains that during a social gathering of high profile men and women, there was a man who was smart, clever and was very keen on observing his surroundings. He was quick witted and knew how to act accordingly. This man was appointed as the head of the table, where he was given the task of carving and slicing the meat of the turkey and pork for the guests at the dinner. After the dancing and talking, everybody was getting ready for the dinner and they all started to gather around the meat carver, to see him cut his meat. At that exact moment, he forced himself too much and let out a loud fart that was so loud that almost everyone in the room heard it clearly and distinctively. After the fart was let out, there was an awkward silence in the room, with all eyes on the meat carver. The meat carver was a very positive man and he knew how to act accordingly to the situation. He then showed off by rolling up his sleeve and declaring loudly that he can now carve the meet without farting. All this was done without a single drop of regret and embarrassment on the person’s face. In the end. the person was not remembered for not letting out a fart, but for the behaviour in which he confronted the situation. Unlike usual people, he didn’t leave the room crying and feeling embarrassed. If he had done so, then it would make a great change for others to talk about and make fun of him. Be thick skinned and act like the whole situation never even bothered you and you had to just do your thing. 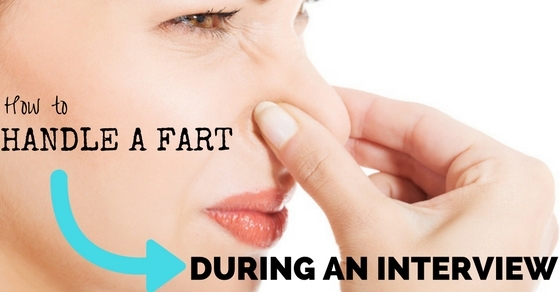 No impulsive farting situation is something that you cannot handle or prevent from happening. Just apologise for the inconvenience and disturbance that you created and just carry on with your own work. If such a thing occurs to you, then the next method is to look in to the interviewer’s eye, apologise for letting out the fart, and hope that you won’t repeat the same mistake again and then just act like nothing happened. These kind of situations might act as a hidden blessing for you, since you are being honest and truthful and the interviewer could see a part of your personality on how you will handle such awkward, sudden and embarrassing situations. Though the interviewer might not and most probably will not, forget about the fart, but he will be greatly impressed by the amount of gusto and professionalism you had maintained during the interview after encountering such an embarrassing situation. This kind of personality is very much needed for a working individual who is ready to work in an unpredictable and changing environment. Next articleHow to Take the Perfect Power Nap at Work?